If you’re trying to read the stars or just wish upon one, it’s never been easier. Located three miles from UM’s campus (and away from all the distracting city lights), the James Wylie Shepherd Observatory is the perfect place to gaze into the cosmos and become one with the universe. 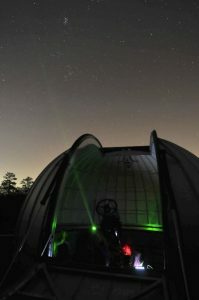 The facility comes equipped with a state-of-the-art 20-inch PlaneWave CDK20 telescope on a Chronos HD32 Harmonic Mount that sits atop a Pier-Tech hydraulic pier in a fully robotic 20.5-foot diameter observatory dome. Sound impressive? Trust us—it is. The physical address of the Observatory is 1093 Pebble Road, Montevallo, AL 35115.